THE PROBLEM OF airport security has again been in the spotlight this week, with Dublin Airport coming in for criticism over apparent “deficiencies” in its systems. It’s not the first time that the world of scanners and searches has hit headlines. After an apparent plot to blow up transatlantic flights using liquid explosives was uncovered in 2006, most liquids and gels were banned from aircraft. Since then the stakes have been raised with an underwear bomber – and even suggestions that explosives could be carried inside the body. It all suggests an ongoing battle between global security operations, and those who are out to thwart them. So what does the future of passenger flight hold? TheJournal.ie set out to find out. Why aeroplanes? How did airport security come to be the front line in the so-called ‘war on terror’? The reason, paradoxically, is partially because of our own fear. The cultural status that air disasters hold, and the huge media coverage that they generate, make planes an appealing target for anyone looking to get the world’s attention. 2. So what can we do? Thermal lie detectors. A UK team last year claimed that it had promising results in trials of thermal-imaging technology that detects somebody telling untruths by tiny variations in their facial temperature. “When someone is making something up on the spot, brain activity usually changes,” the research director told CNN. Zero-radiation technology. One of the current concerns over much scanning technology is the radiation it uses. But US firm Millivision has developed a system it calls the Passive Millimeter Wave Imager, which uses no radiation and – the company claims – is superior to X-rays, metal detectors and pat-down searches. Here’s a promotional video showing (a) how the system works, and (b) how, apparently, to carry a ceramic knife through security. Profiling – the kind of detection used by the so-called ‘checkpoint of the future’, where behavioural cues and other information is used to identify a threat – also has its problems. “Even with the best kinds of profiling the error rate is quite high,” says Bloom. This is especially problematic when it comes to false positives; people who just happen to fit the profile of a ‘threat’. When too many people get hauled off for interrogation too many times – or strip-searched, or worse – the system starts to break down. 4. Can we ever win? What this means in practice is that the experience of air travel, with all its attendant frustrations, isn’t going to change. There will still be queues, and we’ll in all likelihood still have to unpack bits of our bags. And here’s the thing: even if terrorism went away entirely, we couldn’t go back to the days when you could just stroll onto a Stratocruiser and be handed a champagne cocktail. This, says Bloom, is because the whole aviation industry has changed almost beyond recognition. Airlines’ costs, especially fuel, have risen dramatically and they are under more pressure than ever before. As a consequence there are fewer flights, and they’re more often full. “Unless someone comes up with a new economic model,” Bloom says, or “a new way to fuel an aircraft” – we’re in for more of the same, for the foreseeable future. Appendix: What is currently being done to combat the threat? A lot. There are “vast” resources being poured into protecting air travel, says Bloom. But here’s the thing: most of it we don’t even see. The pesky bag scanner and (maybe) pat-down search that we go through at the terminal is just the tip of an iceberg, the bulk of which extends far beyond the airport building. Data mining of communications: email, phone conversations, messaging of all kinds. “A huge amount of data is analysed and correlated, allegedly to find patterns predicting terrorist events.” This is often how people end up on so-called ‘watch lists’. ‘Behavioural detection’ and profiling: This might be carried out in the airport itself, but goes unnoticed by all but a fraction of passengers. It involves trying to isolate key indicators – nervousness, agitation, suspicious behaviour – that might identify a threat. 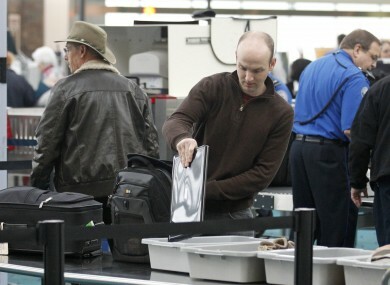 “Technology-oriented screening procedures“: the scanners we all know and love. Email “Explainer: How will airport security fight terrorist threats in the future?”. Feedback on “Explainer: How will airport security fight terrorist threats in the future?”.